ItemA-02734 - "Rock Bay Bridge", Victoria, Decorated For Visit Of The Governor General. ItemA-02743 - "First bridge over the Gorge - Victoria Arm"; four logs used as Gorge Bridge; left to right is Albert Maynard, and J.M. Reid. ItemA-02747 - The second bridge over the Gorge, Victoria. ItemA-02753 - The third Gorge Bridge, Victoria. ItemA-02763 - The Gorge, Victoria, Showing Third Bridge. ItemA-02766 - The Gorge, Victoria, Showing Third Bridge; R. Maynard In Foreground. 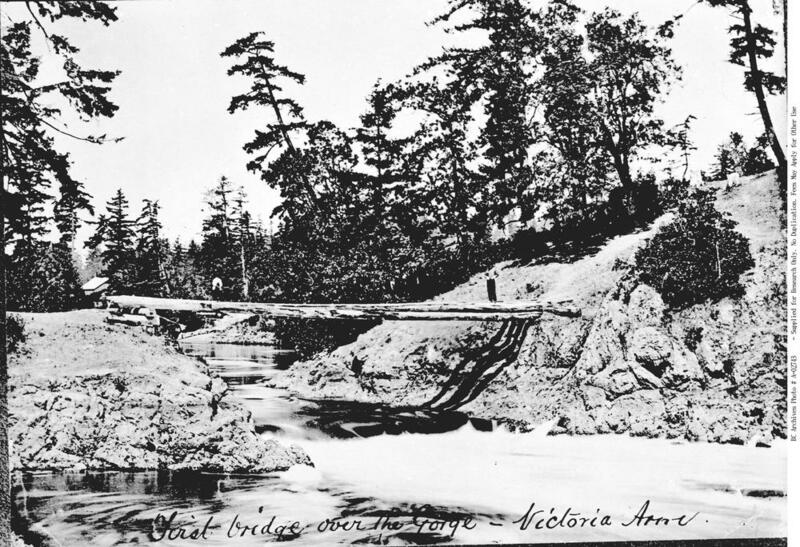 Item A-02743 - "First bridge over the Gorge - Victoria Arm"; four logs used as Gorge Bridge; left to right is Albert Maynard, and J.M. Reid. Restriction: image HP08049 is a glass plate negative. Researchers should consult the online reference image or reference room copy prior to consulting the original.